It’s not been our greatest year on the allotment. As I’ve written before, too many other things have been getting in the way, and coupled with the awful weather we’ve had, we’ve had our fair share of failures. Now that we have some more help with the work, in the shape of my mum, things are getting lots better and I have lots more renewed enthusiasm for it. In fact, my enthusiasm for gardening as a whole has gone through the roof recently. There is something very satisfying in working with your hands and the process of making things grow, or at least attempting to, is such a soulful and satisfying one that I’m hoping to make it a source of income at some point in the future. With this in mind, I’m going to attempt to take the RHS level II courses to give me some formal qualifications. 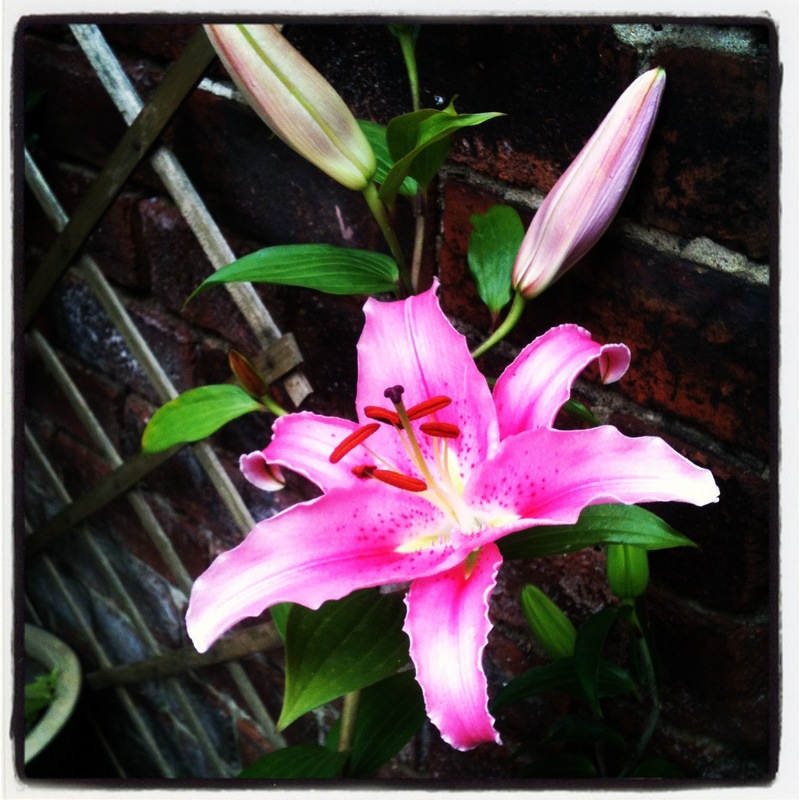 This lily has survived the horrible weather, being driven over by toy trucks and repeated over-watering by the kids. It looks far too exotic to be growing in my little Northern back yard, but there it is in all its flamboyant beauty. Perfectly positioned in a pot so I can gaze at it through the window when I’m doing the washing up! It smells incredible too, a bold heady fragrance. I’ve been tempted to cut it and bring it indoors but I’ve realised that it is better where it is. It’s made me think about a couple of things. Firstly, that plants want to grow. Really, really want to grow. Fling a few seeds in a pot and the chances are that something will come up. Even if you think you have no green fingers at all, I do urge you to try. Growing anything, even a few herbs, will really give you lots of pleasure, and you never know where it might lead you. The other thing that I’ve been thinking about this flower is that it won’t be here for long. Soon it will die and I’ll no longer be able to look at it when I do the washing up. But that, perhaps, is a good thing. I would never want to not be filled with joy when I look at it. Never want to just take it for granted. I always want to be proud that it’s grown at all! So, I accept that its beauty will fade, and I won’t see it again until next year. The memory of it will remain, and that stimulus, the one I have had to develop gardening as part of my paid working life, will hopefully live for much longer. 2 Responses to Growing: gardening and career changes. How beautiful! The flower, your allotment, the way you write and you’re plans for the future. Good luck with all of it!